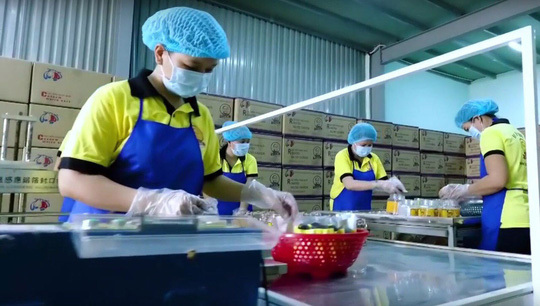 VietNamNet Bridge - Brokers and Chinese-related enterprises are seeking to buy Vietnamese small and medium sized farm-produce and seafood export companies. A financial expert said some brokers working for Chinese firms had contacted him to inquire about such companies. General director of Gia Bao Cashew, Tran Van Son, also said Chinese businesses are ‘hunting’ for Vietnam’s enterprises, especially ones that lack capital or are taking losses. During a trade promotion trip to the US, three Chinese enterprises met Son and told him of their intention to contribute capital to Gia Bao. One month later, the three enterprises came to Vietnam to negotiate with Son about enterprise valuation and capital contribution. “They promised sustainable cooperation to develop the international market and pledged to pump a huge amount of capital. In exchange, they wanted the right to manage Gia Bao,” Son said. Son refused the invitation for cooperation, however, after consulting enterprises in the same business field. The Chinese enterprises failed to take over Gia Bao, but they succeeded in buying some companies in Binh Phuoc province. Brokers and Chinese-related enterprises are seeking to buy Vietnamese small and medium sized farm-produce and seafood export companies. “Chinese investors, after contributing capital, will take control over enterprises’ operations and learn about Vietnam’s roasting skills. Three or four months later, when they master the roasting process, they will negotiate to buy the remaining shares in the enterprises, or say the enterprises are taking losses,” Son said. “They will make the enterprises unprofitable for a long time with the aim of swallowing the entire enterprise,” he said. The manager of a rice export company in Vinh Long province which specializes in exporting rice to China across border gates also said he had turned down capital contribution invitations from Chinese. A report from the Ministry of Planning and Investment (MPI) showed that in 2018, investors from China, Hong Kong and Taiwan spent $3.4 billion to buy into Vietnam’s enterprises. Chinese total investment capital in Vietnam was $2.46 billion, which included $1.6 billion worth of FDI capital and $800 million in portfolio investment. A financial expert noted that Chinese investors tend to inject capital into both projects and businesses, which shows that they want to take over Vietnam’s enterprises, learn about Vietnam’s market, and get ready to bring capital to Vietnam, if necessary. Tran Quang Thang from the HCM City Economics & Management Institute attributed the wave of Chinese investors buying into Vietnam’s enterprises to the US-China trade war, which has affected China’s exports to the US.